It seems like just about everyone has his own personal blog or online business these days. If you’re looking to start a website, you don’t have to be overwhelmed by the idea of creating a site from scratch. Blogging sites like WordPress and Tumblr are great places to start if you don’t have much experience with web design, because they offer a huge selection of templates to work with. Or you can get as hands-on as you want with a self-designed and self-hosted website, if you prefer. You probably want your site to be unique and personalized, but you also want it to strike at least a semi-professional pose. Finding the right balance between personalizing and keeping things simple is important if you expect your website to grow over the coming months. The best sites are easy to navigate but still manage to stick out from all the other countless blogs and sites on the web. If you want to have a blog that stands out from the rest, a unique design is the best way to do it. Whether you create the graphics and mess with the fonts and colors yourself or you hire someone to beautify your blog, you won’t regret it. Having a well-cared-for site is pretty much essential to maintaining a strong online presence and could lead to job opportunities and partnerships if your site excites attention. This is key to building an online following once you have a smart-looking site. The people who gain millions of followers overnight are the exception; most websites build their reader base slowly over years of producing content. By posting quality content on your site on a regular basis, you give visitors something that’s worth reading and worth sharing and talking about, which is the best way to draw the attention of new readers. Social media is there, so use it. Create personal accounts or profiles specifically for your website on social networking sites like Twitter, Facebook, Tumblr, and Pinterest. Depending on the subject of your website, you might have more luck on particular social media sites as opposed to the biggest ones — like posting links for a food and recipes blog to sites like Pinterest and Foodgawker, for example. When posting to social media sites, you can risk coming across as boring and repetitive if you only post links to your site. Along with promoting your own content, interact with others and promote similar blogs that you enjoy and admire. This will help you grow your network and build positive relationships with people online. If a follower has a personal connection to you, they’re more likely to keep tabs on your website and share the links they read and like. 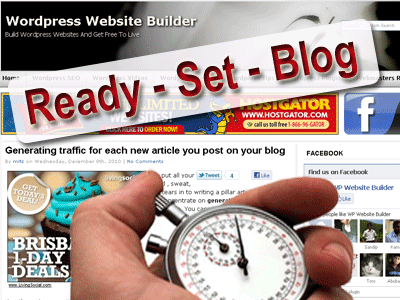 Every website is different, and a personal blog has vastly different hosting needs than a large online business. If your website starts receiving heavier traffic or you start selling products through it, you’ll want to consider upgrading your hosting in order to meet your site’s growing needs.